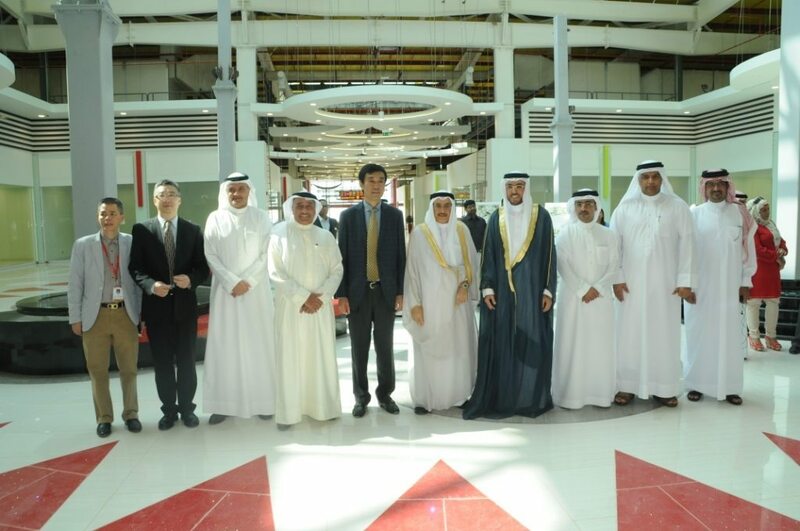 Diyar Al Muharraq received the Deputy Prime Minister of Bahrain and the Chairman of the Ministerial Committee for Services and Infrastructure, His Excellency Shaikh Khalid bin Abdulla Al Khalifa for an inspection visit to #Dragon #City, a Chinese themed retail and wholesale development in the master planned project on Sunday, the 18th of October 2015. The Deputy Prime Minister and the accompanying visiting delegation were welcomed upon arrival to the Diyar Al Muharraq site by the Chairman Mr. Abdulhakeem Alkhayyat, the Managing Director Mr. Aaref Hejres, the Chief Executive Officer Dr. Maher Al Shaer and a number of senior officials from Diyar Al Muharraq, Bin Faqeeh Real Estate Development Company, Chinamex, Banz Group and Nass Contracting. Diyar Al Muharraq officials conducted a brief yet comprehensive presentation regarding all the components of Dragon City after which they accompanied the visiting delegation on an inspection visit to Dragon City which included a detailed tour of the Shopping Area that is elaborately segregated into different categories based on the nature of the merchandise being sold in the respective outlets along with visits to the Asian Dining Street and the Warehousing Area as well. Dragon City is due to open its door to the public before the end of 2015. 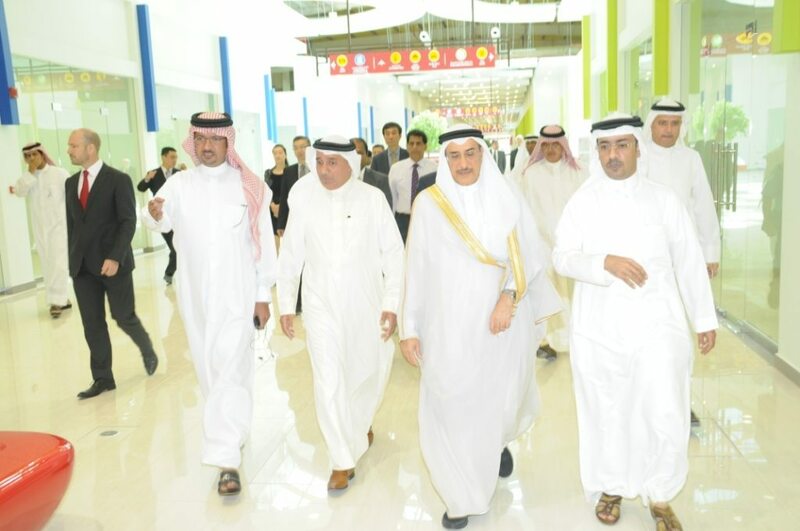 On this occasion, the Deputy Prime Minister of Bahrain, His Excellency Shaikh Khalid bin Abdulla Al Khalifa expressed his delight at the fast paced progress that Dragon City has witnessed from initiation of the project to its current stage of near completion. His Excellency reiterated his pride that Bahrain is embracing one of the most prominent Commercial projects in the region and he reaffirmed the Kingdom’s strategy highlighting the importance of attracting foreign investments through distinguished projects that serve the national economy and allow for the provision of employment opportunities in addition to meeting consumer demands at both the national and regional levels. “Dragon City will herald a series of achievements for Diyar Al Muharraq as we are building a niche to become a vital player in Bahrain’s economic development and we are taking confident steps towards fulfilling our goals into developing the Kingdom into a world class commercial and trade destination. This project is set to offer so much to the Kingdom of Bahrain including and not limited to a substantial increase in employment opportunities and a general mixing of two highly celebrated cultures that will have a highly positive impact on the economy of the Kingdom of Bahrain. We reiterate our unwavering commitment to ensure the success and subsequent prosperity of Dragon City”, he added. Spread over a total land area of 115,000 square meters, Dragon City is the first of its kind development in Bahrain, which will offer unique wholesale and retail opportunities to local consumers, trade customers and tourists. Phase 1 of Dragon City encompasses Dragon Mall and a themed “Asian Dining Street.” The Mall Design, occupying a built up area of 56,000 square meters, is infused with Chinese architectural and cultural aspects incorporating over 747 individual retail stores and additionally, a 4,500 square meter area designated for warehouses. The project also includes the Asian Dining Street, spanning a land area of 6000 square meters and a car park large enough to accommodate 1,500 cars. To date, Dragon City has obtained 100% lease interest and the occupancy rate has reached 90%. The Dragon City concept was launched in May 2012 as the result of an agreement between Diyar Al Muharraq and Chinamex. Gulf House Engineering was appointed for design and supervision, Nass Contracting for construction and Baker, Wilkins & Smith Middle East (BWS) for cost consultancy services, while Cluttons were appointed as the leasing agent for the project in the Kingdom of Bahrain.